This is designed for high volume production. It will be manufactured according to the volume. The speed of the conveyor can be controlled by DC motor or reduction gear drives. Temperature according to customer's requirement. Uses: Ceramic Tiles, Automobile, Food and other industries. Incorporating all the latest design principles for great baking, safety, economy and long lasting reliability, Teltech Rack Ovens are ideal for industrial baking such as varnish baking, paint baking, etc. A gentle airflow and energy efficient design provide you with the highest quality baking and years of low cost operation. Our ovens meet the highest standards in quality, reliability, consistency and durability the industries. A bottom-loading design for rapid quenching of light weight alloy castings. 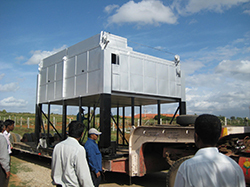 We design and build many variations of this versatile heat treatment oven and include all ancillary equipment including water and polymer quench tanks, control systems, load baskets and lifting systems. 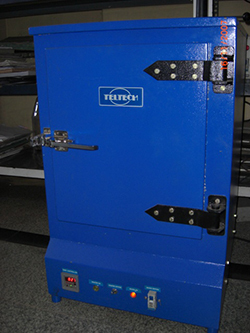 Draw type oven with gas fired fume incineration for motor burn-out and similar applications. Loading drawers can be manually operated or pneumatically powered. Fume incinerators comply with environmental regulations. Traditionally for solution and ageing treatments of aluminium alloys that require transfer to adjacent quench tank. Close temperature control and uniformity mirrors that of our rapid quench ovens. Top loading ovens may also be used in conjunction with bottom loading heat treatment lines to provide additional capacity for ageing processes. Many door configuration options, hand or power operated. The versatile front loading oven can be loaded by fork-lift truck or we can supply tailor made loading trolleys and trucks, powered bogie hearths and other innovative loading arrangements. 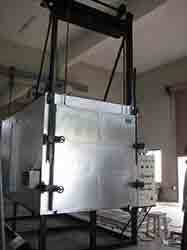 This type of oven can be used in all industries and for all processes where batch production is required. For continuous or intermittent feed involving mesh belts/honeycombs, chain and slat. Tailor made to suit a wide range of applications where continuous production is essential Conveyorised ovens can also be designed for overhead and vertical applications.